Beck is acting like an active musician this week: Last night he played a Sasquatch! warm-up show at Los Angeles’ El Rey Theatre, and today he announced he’ll be releasing a single via Jack White’s über-inventive Third Man Records. 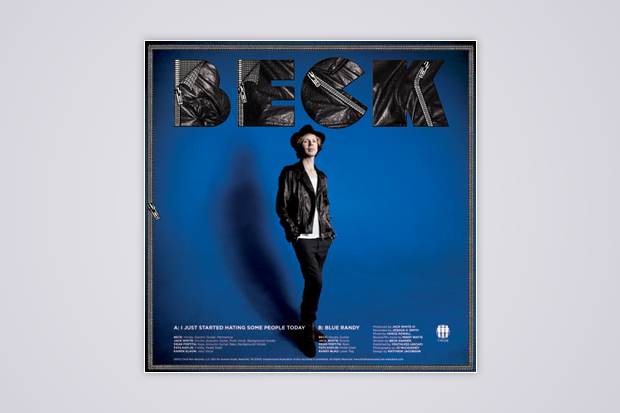 The 7-inch, featuring the passive aggressively named A-side “I Just Started Hating Some People Today” (backed with “Blue Randy”), was recorded “while Beck was in Nashville working on new material for his long-awaited next album,” per his reps. By the sound of the clips posted to the Third Man site, they are very, very Nashvillian. This new Third Man-released single will drop, presumably not from the sky, in five days, on May 28. If you live in Salt Lake City, you can try to get your hands on one of 100 fancy-pants copies (that is, Tri Color pressings) at Randy’s Records. If you don’t, and still want a chance to get one of those, order the single for delivery, because Third Man will be sending out 50 of them, at random, to mail orders.